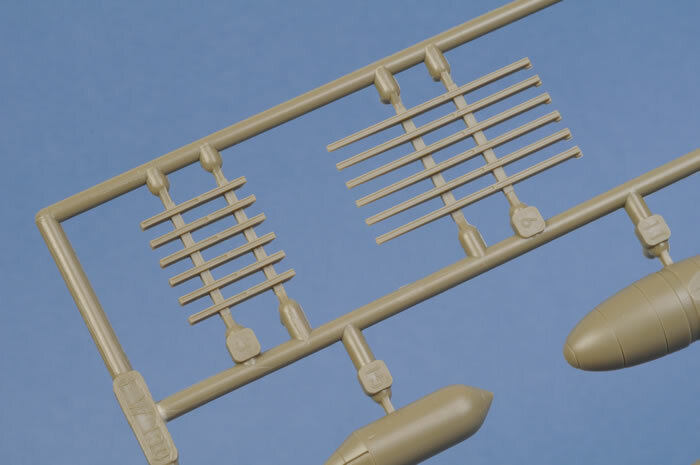 Contents and Media: around 300 parts in olive coloured plastic; 11 parts in clear; two photo-etched frets (one colour, one nickel plated); markings for five aircraft. 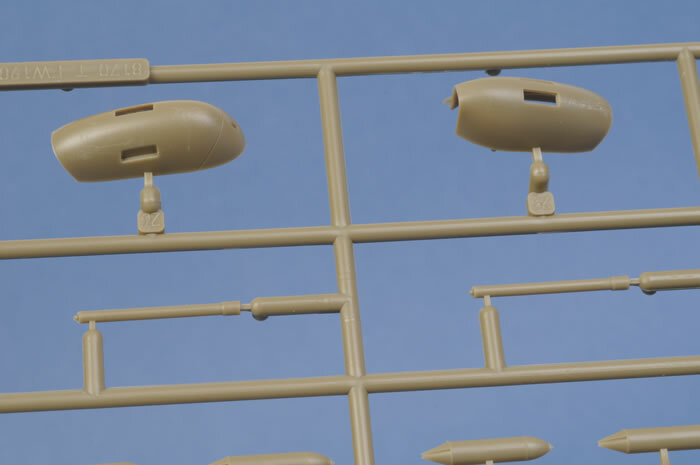 Advantages: Beautifully detailed including engine and gun bays; superbly restrained surface featuring crisp panel lines and very fine lines of recessed rivets where appropriate; engineered without plugs/inserts; wing cannon access hatch not split along wing root join; large number of ordnance options; clever design of clear parts with separate sliding sections for open and closed canopies; very high quality plastic; narrow sprue attachments; excellent instructions and packaging; improved yellow on decal sheets; plenty of spare parts! Conclusion: A beautifully detailed Wurger for experienced (and patient) modellers. The Focke-Wulf Fw 190 F series was the dedicated ground attack version of the versatile Wurger family. The Focke-Wulf Fw 190 F-8 was based on the A-8 fighter, but with additional armour built into the airframe and provision for a wide range of additional stores on the wings and fuselage centreline. The extra armour was not externally visible, so the best visual cue to distinguish an F-8 from an A-8 is the absence of wing guns. Note, however, that the bulge above the wing gun position was still installed on the F-8. The cockpit was also similar to the fighter, but the F-8 was fitted with a rectangular panel below the instrument panel with bomb arming switches and associated equipment. Similar to the real thing, Eduard's new Focke-Wulf Fw 190 F-8 is heavily based on their earlier A-8 kit. 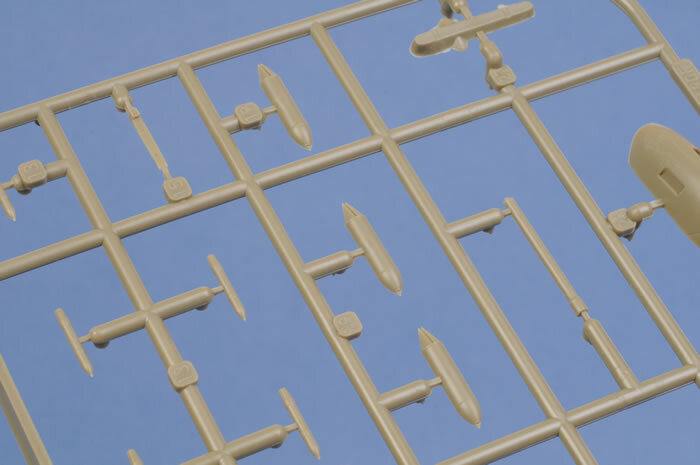 Three new sprues are included, along with a large new photo-etched fret. In common with their Fw 190 A-8 kits, this new F-8 is state of the art in terms of quality of injection moulded parts, detail and markings. 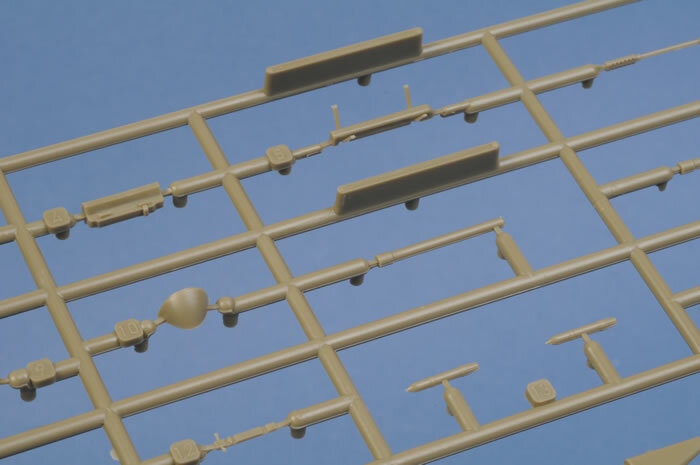 Rather than repeat the entire description of the kit, let's focus on the new parts. 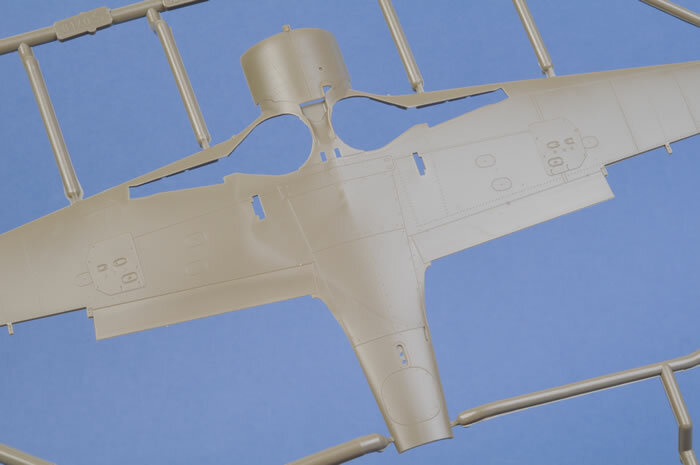 For a detailed examination of the remaining parts, check out our original review of Eduard's 1/48 scle Focke-Wulf Fw 190 A-8. 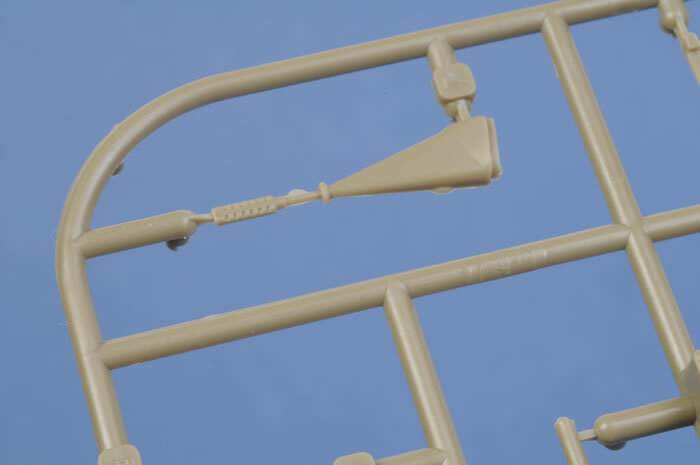 The first of the new sprues in Eduard's 1/48 scale Fw 190 F-8 provides the new lower wing with its blank cannon access hatches. 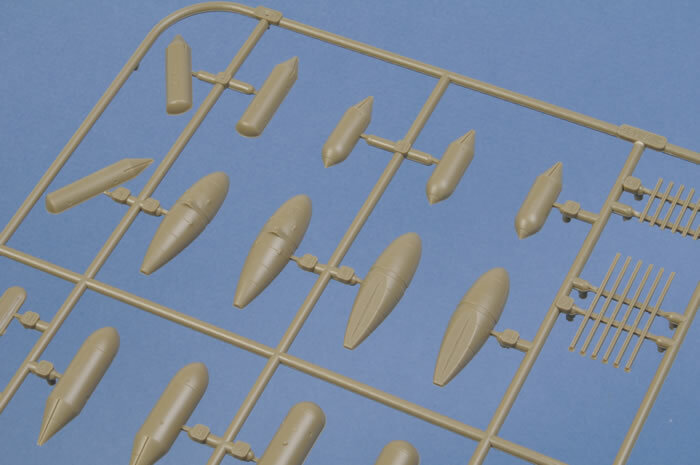 This sprue also includes two styles of bombs. 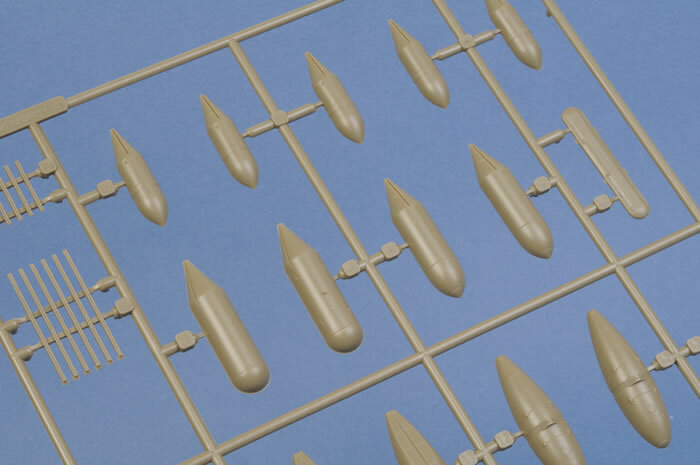 The other two sprues are dedicated to stores, and they are chock-a-block full. 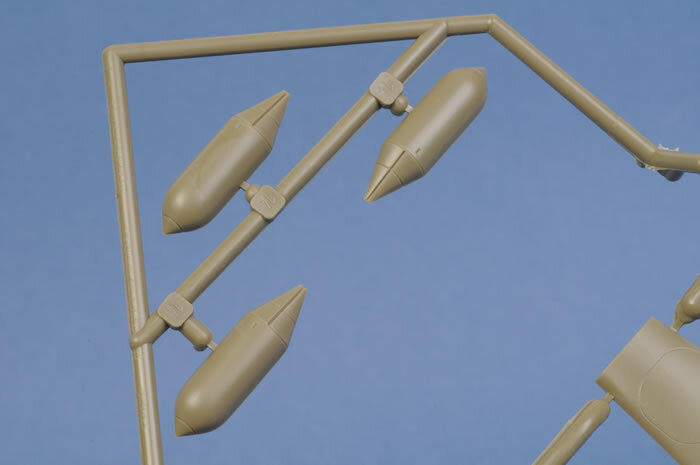 Ordnance includes AB 500, AB 250, SC 500, SC 250, SD 250, and SC 50 bombs; ETC 50 and 503 racks; Pb 1 early and late rockets and rails; two styles of external Mk 103 cannon; and Ps 2 rocket tubes. Extra drop tanks are included too. 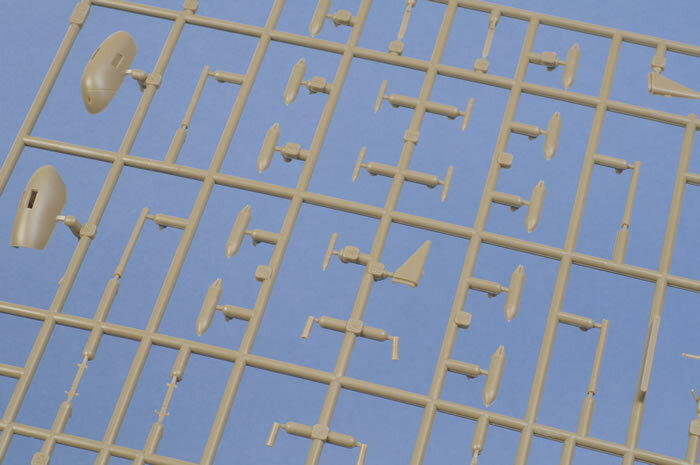 The additional photo-etched fret is mainly comprised bomb and rocket tails in scale thickness. Markings are included for five interesting and varied late-war Wurgers. Decals, as always, are beautifully presented - thin, opaque and in perfect register. I am also pleased to report that the RLM 04 Yellow markings are a much richer shade which I think reflects the actual colour much better than Eduard's earlier efforts. 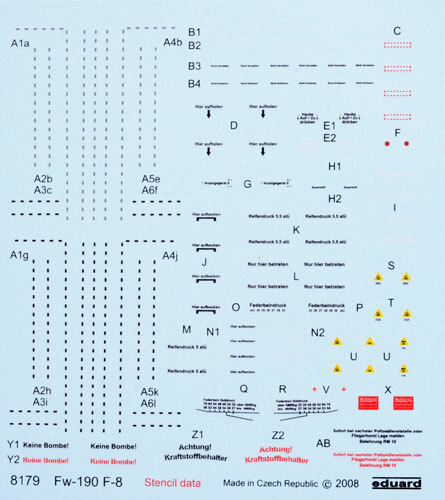 The decal sheet includes red and yellow markings for the bombs. 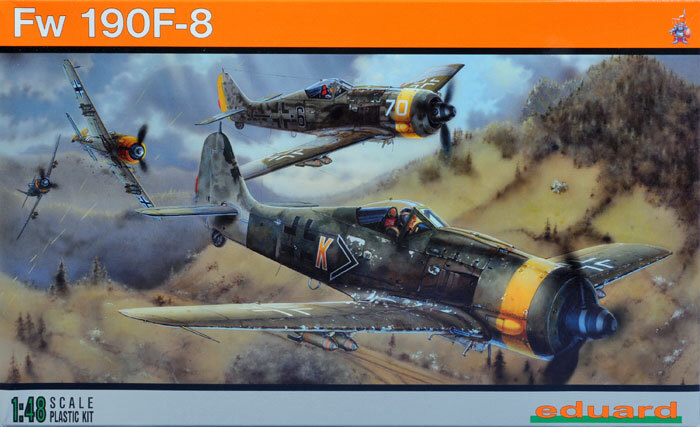 There are only two alternative Fw 190 F-8 kits available in 1/48 scale - Dragon's rare old kit, and Tamiya's F-8. Eduard's kit is certainly better detailed than both of these older kits. 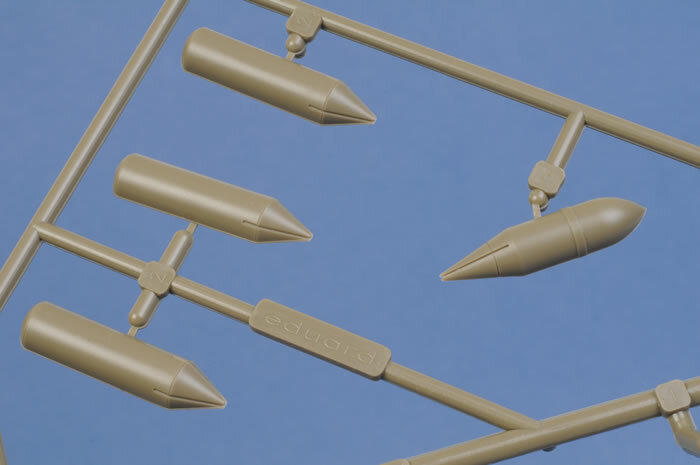 It will be no more difficult to build than Dragon's and is more accurate than Tamiya's. 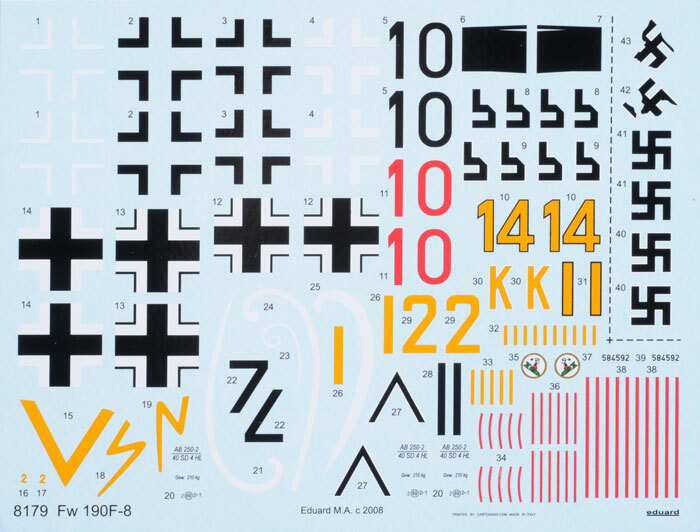 The abundance of stores makes Eduard's Fw 190 F-8 an instant spares box as well as a beautifully detailed kit in its own right. Keep in mind, though, that this is not a model that will fall together by itself, so you will be advised to allocate plenty of time and treat it with the respect that it deserves. 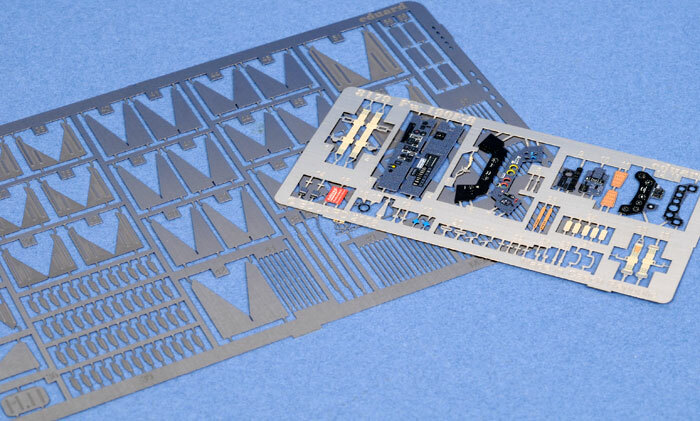 If you have already assembled a few kits, however, you should not have any trouble.